Hop this finds all your home and pro-brewers and distillers out there fit and well and Marchin' onwards and upwards in your Brewing and Distilling adventures. Why are we talking about Oktoberfest in March? Well as you read on...now is the time to brew your Märzenbier (in the month of March) so you can "lager" it through the winter and let those soft and delicate malt flavours shine through with a brewers best friend - Time! Unlike Oxygen and Heat the enemies of every great brewer, Time can literally heal all ills. It will clear your beer, let your flavours mellow and settle out and if your chasing a Malt Driven Lager to perfection time truly is your best friend. Malt of the Month - Crisp Light Munich Malt - Hop of the Month - Hallertau Tradition - Yeast of the Month - GY045 German Lager GigaYeast - Adjunct of the Month - Crisp Rye Malt - Equipment of the Month - Hanna - pHep®4 pH/Temperature Tester - HI98127 - but wait! there's more...BeerCo All Grain Recipe of the Month - Oktoberfest | Märzenbier and let's not forget another great How to Brew like a Pro! 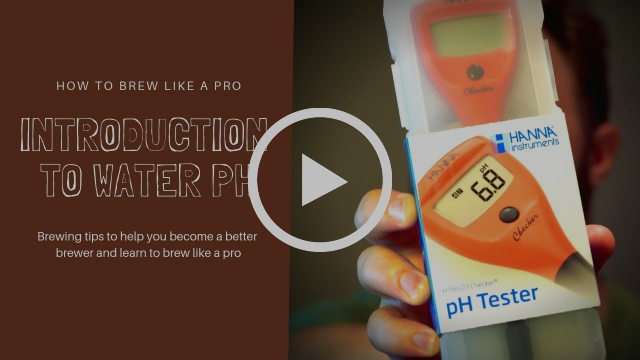 video from our great mate Andrew at Stass Brewing on Introduction to Water pH and phew...that will do it for now...go and brew and/or distil happy! Oh, yeah! Least we forget, More Fresh Crop 2018 US Hops have dropped into the Shop! including Mosaic®, Ekuanot™, El Dorado® and Cashmere along with fresh Crop 2018 GR Hops and CZ Saaz. We still have some great SPECIALS on to clear out Crop 2017 US and GR Hops which are selling out FAST! Hop on over to the Shop Specials page and Shop Happy and SAVE! I used about 7% in a Munich Helles and it provided very nice melanoidin/ toasted bread notes. Seems lighter on the colour scale than other light Munich I've used, perfect to add some complexity to lighter ales and lagers! Crisp Light Munich Malt colour ranges from 15 to 25 EBC (IoB) and Crisp Dark Munich Malt colour ranges from 40 to 50 EBC (IoB). Munich Malt has its origins in Germany where traditional beers gained their rich malty character from the addition of specialist malts with enhanced colour and flavour. These products are made on a conventional malt kiln using processes that promote higher levels of soluble protein and simple sugars which interact when heat is applied to produce a product rich in melanoidins and other colour and flavour compounds. The malty flavours associated with Munich Malt contrast with the caramel-like flavours associated with crystal malts and the golden to reddish hues to the colour is popular in some beer styles. Insist on Crisp Light Munich Malt- Buy NOW! Nice flavour and what more could you want for a traditional German hop in a German beer. Hallertauer Tradition GR Hops were bred as a successor to Hallertauer Mittelfrüh and was licensed in 1993. Comparable to Hallertauer Mittelfrüh, Hallertauer Tradition is distinguished by its good yields. The predominant aromas in the raw hops are those of citrus and lime, accompanied by vegetal notes. In a cold infusion, sweet fruits such as apricots contribute to its fine flavour profile. Try a NEW! GR Noble Hop! Buy Hallertau Tradition NOW! This is EXACTLY what I remember beer tasting like while I was in Germany. GY045 is a bottom fermenting German Lager GigaYeast used in commercial breweries around the world. GY045 German Lager GigaYeast produces a slightly sweeter but clean beer with a malty finish. Perfect for Pilsners, Märzen, Fest bier etc. GY045 GigaYeast may require a diacetyl rest after fermentation. Get Your Giga On with GY045 German Lager GigaYeast! Hanna's pHep®4 waterproof tester is an advanced meter has many features that can be found in portable and benchtop meters. This ergonomic meter measures from -2.0 to 16.0 pH with an accuracy of ±0.1 pH. pHep®4 features automatic one or two-point calibration and automatic temperature compensation. The large multi level LCD display shows both pH and temperature readings simultaneously, while a stability indicator is displayed to alert the user when a stable reading has been obtained. The pHep®4 tester also features a replaceable pH probe that has a unique extendable cloth junction to clear any clogging that occurs. Measure pH like a Pro! BUY ONE NOW! In brewing, when mixed with barley malt, rye malt can improve head retention, improve mouthfeel and introduce flavour changes of a toffee/caramel note at lower inclusion rates and a spicy after-palate at higher inclusion rates. Most notably, rye malt will also impart a reddish hue to beers. Insist on Crisp Rye Malt in your next Brew! BUY NOW! Time to reach for the lederhosen, knee high socks, put your hair in piggy tails or try on some skin tight skivvies and amp up some strange German techno or trance music and drink a traditional Märzenbier or Oktoberfest bier! For this BeerCo Recipe Kit we use a layered malt bill for depth and flavour and a moderate hopping regime with traditional noble Hallertau hop. We trust this will help you celebrate the change of seasons in style with a brew to style - Prost! Brew Your Märzenbier in March! BUY ONE NOW!!! Refer your friends to BeerCo.com.au, and get 10% off Your next order with us!